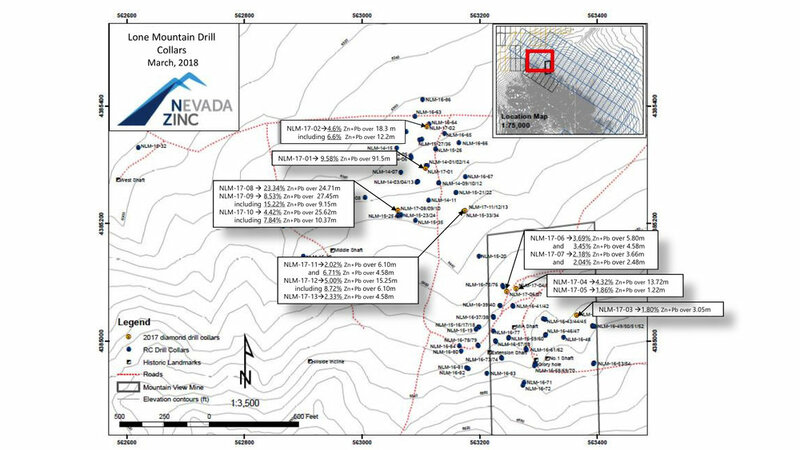 Toronto, Canada March 1, 2018 - Nevada Zinc Corporation (“Nevada Zinc” or the “Company”) (TSX-V: NZN) is pleased to announce additional drill core assay results from its thirteen hole program at the Company’s Lone Mountain Project in Nevada. The core drilling program was primarily designed to corroborate assay grades from reverse circulation drilling and to provide geological information on the mineralized zones as well as to expand the footprint of the mineralization. This new assay information provides important data that will be included when the Company produces its initial 43-101 resource estimate later this year. The current core drill program completed by the Company is the first core drill program completed in the area since the 1940’s and follows up on the Company’s 83 reverse circulation (“RC”) drill holes completed between 2014 and 2016. Core drill holes that accurately twinned previous RC drill holes were largely similar to the extent and the grade of the mineralization intersected; some areas showing significantly higher grade partly because the core drilling equipment, with improved mudding techniques, allowed for better recovery of the mineralized zone than with the RC drilling equipment. Core hole LM-17-01 (previously reported) which was a twin of RC hole 14-01 intersected a similar interval to RC hole 14-01 although the overall assay interval was some 26% higher at 9.58% zinc+lead over 91.5 metres. Core hole NLM-17-09 was drilled in close proximity to RC drill hole LM-15-24 with the former intersecting mineralization grading 8.53% zinc+lead over an interval of 27.45 metres while the latter intersected 50.29 metres of mineralization grading 5.26%lead+zinc. While the interval shows significant variation in total length, the contained length-weighted amount of zinc+lead is quite similar. Core hole NLM-17-10 twinned RC drill hole LM-15-23 with the new hole intersecting 25.62 metres of mineralization grading 4.42% zinc+lead while the RC hole intersected 18.29 metres grading 3.77% zinc+lead. Core hole NLM-17-12 which intersected 15.25 metres of mineralization grading 5.00% zinc+lead, was a twin of the intersection in RC drill hole LM-15-34 which intersected a similar length and grade of mineralization at 16.76 metresgrading 5.96% zinc+lead. Core hole NLM-17-02 extended the mineralization to depth by approximately 25 metres. Core holes NLM-17-3 through NLM-17-7 were drilled in the historic Mountain View Mine area with the best hole, NLM-17-4 intersecting 4.32% zinc+lead over a length of 13.72 metres starting at a downhole depth of 38.13 metres (27 metres vertical). The holes at the Mountain View Mine area were designed to extend the limits of the shallow mineralized zones. Core hole NLM-17-11 extended the mineralization first drilled in RC drill hole LM-15-34 up-dip by approximately 20 metres. Metallurgical test work is ongoing and the results of that work will be reported separately. The Company intends to be in a position soon to start an initial 43-101 resource estimate on the mineralization discovered to-date at Lone Mountain. There remains significant potential to expand the limits of the mineralization discovered to-date as well as potential to discover other areas of mineralization on the property. Nevada Zinc will be presenting at the upcoming PDAC convention in Toronto at booth 2215 on Tuesday, March 6 and Wednesday, March 7. Quality control samples from the lab include numerous control blanks, duplicates and recognized standards. Reference standards used include OREAS-131b, OREAS-133b, OREAS-134b. No significant issues were noted with analytical accuracy or precision. ALS’s Elko location has ISO/IEC 17025:2005 accreditation. Nevada Zinc is a discovery driven, early-stage mineral exploration company with a proven management team focused on identifying unique mineral exploration opportunities that can provide significant value to its shareholders. While the Company continues to maintain a significant equity interest in the highly prospective Yukon gold properties through its majority ownership position in Generic Gold Corp. (“Generic Gold”), the current focus of the Company is the exploration and advancement of the Lone Mountain Zinc Project comprised of 224 claims covering approximately 4,000 acres near Eureka, Nevada and the exploration of the MacBride zinc-copper project in northern Manitoba. The Company has completed 83 reverse circulation drill holes on the property and recently completed a 13 hole diamond drill hole program on the property. Results from the drilling programs have shown numerous broad intervals of medium to high grade non-sulphide zinc mineralization in two locations both of which are located between surface and a depth of approximately 250 metres. Generic Gold is a Toronto based mining company exploring targets in the Tintina Gold Belt in the Yukon Territory of Canada. Since incorporation, Generic Gold has raised approximately $2.4 million to fund 2017 and 2018 exploration programs and has completed diamond drilling on the Livingstone project, trenching on the VIP project, and has completed reverse circulation drilling on its Goodman project. Generic Gold is currently pursuing a going public transaction which is expected to be completed in the next week. For information on Generic Gold’s property portfolio and exploration activities, visit the company’s website at genericgold.ca. The Company owns 25 million common shares of Generic Gold (GGC–CSE) which has 36.75 million shares outstanding.